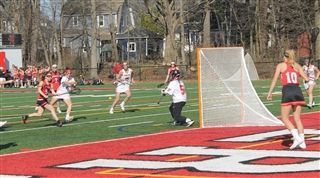 The Kingswood Oxford Varsity Girls Lacrosse team found its footing in the second half in its season opener but fell to Pomfret, 14-9, on Wednesday at Hoffman Turf Field. The Wyverns were down 6-2 at the half but turned things around after the break. Nicole Genga '19 and Mia Seymour’19 score first-half goals for Kingswood Oxford, which came out in the second half and cut the deficit to 6-5. Tori Swanson 21‘led the comeback with four goals in the second half, while Seymour’19, Remy McCoy’20, and Molly Jones ’20 added goals in the second half. The Wyverns got great defensive effort from Jane Dunbar '19, Maggie Eberle '20, and Sophia Kaufman '20 while goalie, Amelia Levine’20 recorded 22 saves in the net. Kingswood Oxford next plays on Saturday at Suffield Academy. The Wyverns then travel to Taft School on Monday and are at Canterbury on Wednesday.